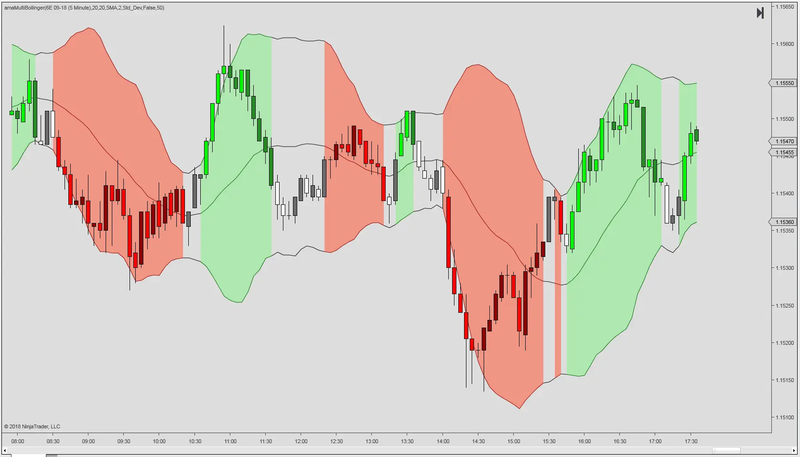 The Multiple Bollinger is similar to the Multiple Deviation Bands. Both indicators offers a selection of 30 different moving averages for calculating the midband. Both have 3 options for calculating the deviation bands. The default setting uses the mean absolute deviation (MAD) from the selected moving average. Alternatively, the median absolute deviation or the root mean square deviation (RMSD) can be used. The upper band of the Bollinger Bands ® is obtained by adding a multiple SMA mean deviation, independent of the formula used for the midband. The opposite is true for the lower, which is obtained by subtracting a multiple SMA mean deviation from the midband. For example, if a Gauss filter is used, the root mean square deviation is calculated by comparing the deviation from the last Gauss filter value. In other words, if an SMA midband is used, the two indicators will plot identically if the same parameters are used for the other settings. If a different midband is used, the Bollinger Bands ® will be different. Finally, the trend may be displayed via a column in the Market Analyzer.